At last fall’s SGIA Expo, Canon Solutions America (CSA) teased a revolutionary new ink technology—UVgel—that would serve as the basis of a whole new wide-format printer line. We hadn’t heard a peep about it since—until now. 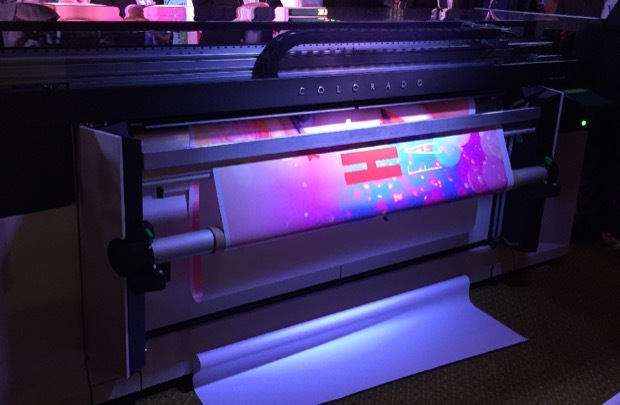 Yesterday, at Canon Solutions America’s Canon One media event in Boca Raton, Fla., the company unveiled the new UVgel-based Canon Océ Colorado 1640, a 64-inch rollfed printer. The new device was designed and built to address the constant need for faster printing and faster turnaround, better overall productivity, and as much automation as can be managed. The issue of speed is handled in a unique way: by utilizing a whole new type of ink. Understanding that while traditional UV—and, yes, I guess we’re calling today’s UV printing “traditional” now—is very fast, one of the limitations on its potential speed is the need to print and cure virtually simultaneously. Couldn’t you print faster if you could print first and then cure later? “We separated the laying down of the ink with the curing of the ink,” said Sal Sheikh, Senior Director, Canon USA Inc., Océ Products LFS Marketing Support, during the Colorado’s unveiling ceremony. Essentially, it’s a kind of “print then cure” process, although the curing isn’t done all that much later. Essentially, the printer has two carriages mounted a few inches apart, swishing back and forth in opposite directions to each other. One lays down the ink, while other runs the LED curing lamp over it. The reason that printing and curing can be “untethered” is that the term “UVgel” is not a metaphor: “I emphasize the word ‘gel,’” said Kris Walewijns, product engineer from Canon’s Venlo headquarters. As droplets of gel—think of a substance having the viscosity of hair gel—they don’t spread out if they are not cured immediately (chemically, gels exhibit no flow; although mostly liquid, they behave as solids thanks to surface tension). They’ll just sit on the media as little microscopic blobs of jelly until they’re cured. The idea was reportedly inspired by the “toner pearls” used in the Océ Color Wave printers, which are melted down into a gloppy, gel-like substance. The goal of UVgel is to offer all the advantages of the three major ink technologies, such as wide color gamut (eco-solvent), no odor and fast drying time (latex), and high productivity and low temperature curing (UV LED), while at the same time avoiding the disadvantages, such as the odors and VOCs of solvent, the high temperatures of latex, and the discernible polymer film of UV. 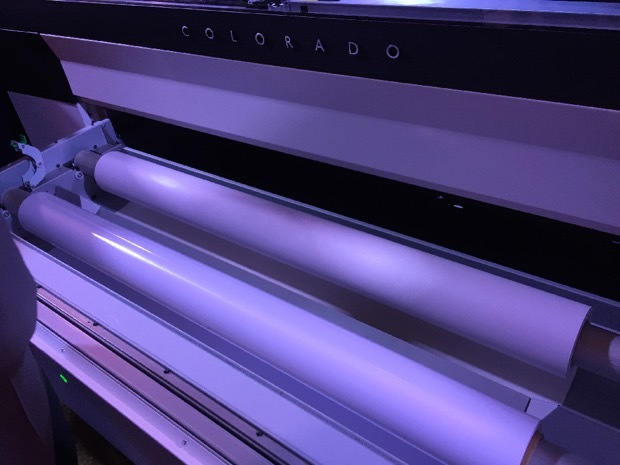 The Colorado can print on all the substrates that other roll-to-roll UV devices can print on, and the only limitation, said Sheikh after the presentation, was that when printing vehicle graphics, it won’t stretch or bend more than 20 degrees or so, such as when trying to wrap a graphic around a rear-view mirror. Still, that’s a pretty minor limitation in the grand scheme of graphics. As I always caution, your mileage will vary, but that ranges from about 2.0 to 5.0 times the speed of competitive printing technologies. The Colorado also has two unique error checking mechanisms that avoid the dual problems of clogged printheads and inconsistent media feeding. To combat the first, it monitors every single nozzle by sending an acoustical signal into the nozzle and then measuring the frequency of the echo. If it differs beyond a certain threshold, it either clears what is assumed to be a clog or turns the nozzle off and uses surrounding nozzles to compensate. That’s pretty cool—and Walewijns was quick to point out that the idea has been patented by Canon. I should think. To combat potential media feeding glitches, the printer lays down a virtually imperceptible yellow line outside the print area with each pass and then scans each line to determine how the media is actually feeding, and thus makes adjustments on the fly. These two onboard quality control mechanisms are part of the emphasis on automation that Canon’s engineers have put into the Colorado, enabling unattended high-quality printing. Another automation feature is the ability to switch between and autoload two separate rolls. The construction of the machine is quite substantial. “It’s built like a tank,” said Walewijns, with “1,500 pounds of steel.” Let’s hope your shop floor is not a five-story walk-up. Now, the burning questions are, of course, how much is the machine and what are the costs of running it? Said John Kaufman, Senior Marketing Specialist for Canon Solutions America, MSRP is $58,000, with a cost of operation “up to 40 percent lower” than competitive machines. What’s even more remarkable is that the Colorado is a four-color machine, and the output demonstrated at the event looked like it boasted a much wider gamut than you would expect from a CMYK machine, due, said Walewijns, to the nature of the way that the droplets of gel are laid down vs. a liquid ink. Earlier in the day, Mal Baboyian, Senior VP, Canon USA, and BISG Océ Products Marketing and Support, had referred to the Colorado as “the most important product introduction in [CSA’s] LFS in 25 years.” That’s not an overstatement. The Colorado 1640 is ready to go, and will start shipping in May. It will be demonstrated next month at the ISA Sign Expo in Las Vegas. We will have further coverage from the Canon One event next week.